Pre-Ballet (ages 3-4): Preschool-Ballet encourages children to use their imaginations while learning to move to classical music. We use a wide variety of props to make this level of ballet extremely fun and help them develop a love of dance! Pre-Ballet is a fun class sure to keep your preschooler moving and learning. This is a Performance class for the Winter and Spring productions. Tiny Dancers (ages 3-5)- This Pre-Ballet class is only offered to Lads and Lassies Community Pre-School Students. The Tuesday class is for Tiny Dancers ages 3-4 & the Thursday class is offered for Tiny Dancers ages 4-5. An introduction to ballet with beginning development of ballet concepts including turn out, coordination & spatial awareness . Students will begin positions of the feet, and introductory movement vocabulary. This is a Performance class for the Winter and Spring productions. Ballet 1 (ages 5-6): Ballet 1 is an age-appropriate ballet class where children will learn basic ballet techniques while working on coordination, balance, flexibility, and musicality. These children will learn correct body alignment and correct classical ballet technique while beginning to work on strengthening exercises at the barre. Ballet 2 (ages 6-7): Ballet 2 uses some of the basic techniques taught in Ballet I and gradually moves the students into a traditional ballet class format of barre followed by center exercises. Students will gradually learn how to 'turn-out' so that their muscles develop correctly. Moving in time to the music and learning classical ballet terminology is encouraged at this level. Ballet 3: Ballet 3 students work on developing technique, vocabulary, flexibility, strength, and coordination. The traditional ballet class format of barre followed by center exercises is used. Ballet 5-Ballet 5 is for students that want to advance their training, and for girls, prepares them for pointe. Correct placement and turnout continue to be emphasized. Students who want to go on pointe must take ballet class at least twice a week, preferably three times per week, in order to build the necessary strength. Students may advance to Pre-Pointe with instructor's recommendation only. Ballet 6/7-( Pre-Pointe/Pointe)-(ages 10 and up): Ballet 6/7 level classes are for intermediate to advanced students. A minimum of 3 performance & technique classes per week is recommended. Ballet 6/7 students must be invited to this class with instructor’s recommendation. 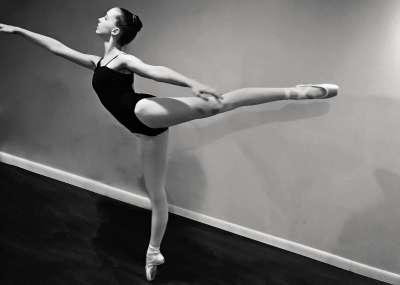 Ballet 7-(Pointe)-(ages 10 and up): Ballet 7 level classes are for advanced students. A minimum of 3 technique classes per week is recommended. In Ballet 7, dancers work on refining their technique to advance their training. Students in this level are all on pointe. Pre-Pointe-Students may advance to Pre-Pointe with instructor's recommendation only. Pre-pointe classes are offered to ballet students who are not yet en pointe to further develop and strengthen the muscles necessary to go en pointe. Pre-pointe classes stress correct alignment and correct classical ballet technique. Stretch & Strengthen (ages 8 and up)- S & S uses a combination of Pilates, floor, barre and other techniques to improve balance, strength, placement and coordination. This class is perfect for athletes who want to build strength, agility and coordination to improve their level of awesomeness! Contemporary - (ages 10 and up)- Contemporary is an expressive form of dance using vocabulary from ballet, jazz, lyrical and modern techniques. Students will be exposed to a variety of movement qualities, musical rhythms and emotional interpretations. Students will learn through warm ups, across the floor and longer combinations. Jazz 1 (ages 7-9)/ Jazz 2 (ages 10 and up)-These Jazz classes will focus on learning proper jazz technique such as isolations of the body, improving performance quality and developing complex rhythms and patterns. Students will be exposed to various styles of jazz such as Broadway, Street and Contemporary to help develop a well-rounded dancer. Both levels of Jazz include a proper warm-up, stretches, across-the-floor progressions, and combinations. Tap 1 (ages 5-8)- This basic tap class focuses on basic rhythm and tap choreography. The class emphasis is on developing proper tap technique, producing clear tap sounds, and having fun. Tap 2 (ages 8 and up)- Tap classes are designed to develop rhythm, style and sound. Students will learn a variety of tap styles from Broadway to Rhythm tap. Exercises focus on building flexibility of the knee and ankles, coordination, and speed of movement. The class emphasis is on developing proper tap technique, producing clear tap sounds, and having fun. Dance to the Beat-Have you been looking for the perfect blend of dance, cardio and sculpting in a relaxed, fun atmosphere? If so, the Adult Dance Fitness class through Beyond the Barre is for you. You will learn choreography to various dances with multiple styles of music while being cued and YOU WILL SWEAT! We will sculpt our arms, legs, and abs using a variety of techniques during the end of class as well.